Here at WTFSEO we’ve long held the firm belief that something happens only because something else first happened. The last domino in a series can’t fall until a person finishes their burrito, puts their plate down and accidentally knocks over one of the dominoes in the middle starting a chain reaction in 2 directions. The same is true of your marketing. Let’s imagine that you’re selling red widgets. There’s a huge market for blue widgets, but until that market is saturated and some celebrity stands up and says that blue widgets are passé, and red widgets are the way to go, you’re not going to be able to sell as many. So your job is to cause that celebrity to get up and say that. Market directly to them, and extoll the virtues of red widgets, whilst knocking down those old fuddy duddy blue widgets. Now when you apply correlation into the mix you can quite clearly see that now you’ve started selling red widgets, other things will start happening for you. It’s the same principle behind umbrella sales leading to rain, and ice cream sales leading to an increase in ambient temperature. 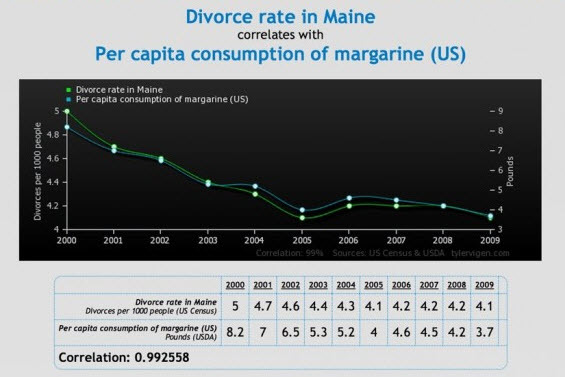 Take a look at this graph for an exceedingly clear idea behind the science of correlation. What this clearly shows is that the family that stays together, spreads butter substitute on their toast together. You can use this information to identify that the best place to sell your margarine is outside family counselling centers in New England. 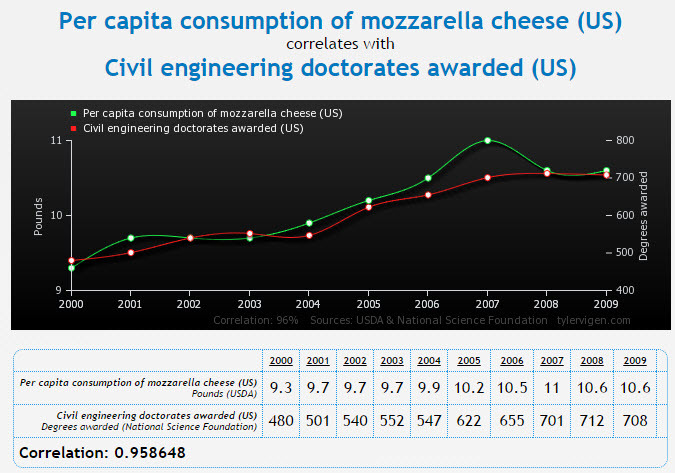 Let’s say that you’ve diversified from margarine to cheese. Should you set up your stands in the same place to sell both products? Should you set up a dedicated Facebook page instead? Should your focus be on optimizing for Bing? Simply look at the data and see where it leads you. There you have it. You need to target engineering schools in May. That’s your peak sales period, your low hanging fruit or low hanging cheese if you will. Now it’s your turn. Let us know in the comments how you’ve flipped the final domino and buttered your mozzarella cheese toasted sandwich.